10 pin bowling is an advantage, as not many people chuck their bowling balls down the LEFT hand side of the lane. Anything involving throwing and catching because I can do it with both hands. As a child I could bat something and fielders did not think to change. I still think it is advantageous. My left-sided brother is always in demand on the left wing. As a dancer I find that my left side is stronger which gives me an advantage over the other dancers who may be weaker on that side. As a lefty pitcher, I had many advantages.The disadvantage was finding a proper glove. As a lefty batter, fielders would always scramble to cover right field. I learned to place hits to left field which gave me a higher batting average. 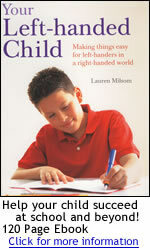 Being left handed had no advantage in American Football or Basketball. At a young age I was taught to play baseball right handed but over the years I developed the ability to play both handed so I could trick people! Badminton!! You learn to play against right handed people and they aren't ready to play against you. It's great!! Badminton, tennis, fencing - people don't expect the'attack' to come from the opposite side as normal! Baseball - Right field HR fence is usually a shorter distance. Plus, being lefty at 1st base, advantage on the pick off position if runner on-base, as pitcher, Southpaws are in high demand. Baseball & softball. Playing first base being left handled is really a good advantage, not having to turn to throw. Baseball (to a certain extent), most certainly fencing. Baseball, pitchers have a hard time pitching left handed. Baseball, softball, tennis. It is very difficult for right-handed opponent to adjust to your "backwards" position. Baseball. I was a switch hitter. Baseball. It confused the pitcher. baseball/softball, most don't know what to think of a lefty. Baseball/softball, they don't expect a left handed batter so it's easy to score a run. Baseball: I can bat on both sides of the plate. Golf: I can use both right- and left-handed clubs. Baseball-I bat right but I'm also left-eyed. that eye faces the pitcher. basketball and softball/baseball was always easy to do well as a leftie. Playing against right-handers drove them crazy, because I could block all their shots, and field balls better. basketball because I can dribble with each hand and most kids can't. basketball, baseball (especially a pitcher), and even tae kwon do sparring. basketball, I had a tendency to go to my left and I was point guard so it was not what they were prepared for. being a minority is an advantage because the opponent has to adjust. Being lefthanded in volleyball gives me an advantage when I spike the ball. Batting lefthanded in softball can be an advantage as well if the pitcher is unused to pitching to a lefty. But I am told that left handed batters area 2 steps closer to 1st base when playing baseball. Cricket! Better bowlers...also Golf. I play right handed and was told lefties who play right handed were the best players...hmmm..didn't help my game much. Cricket, able to bat either way. Bowling around the wicket. cricket, baseball etc; the fielders all go to the wrong side to where I hit the ball. tennis was also easier as I angled the ball differently, and play tennis ambidextrously. Did you know left handers cant play polo? Distinct advantage in baseball because pitchers aren't used to pitching to left-handed batters. Also in basketball, most players are only capable of shooting basket from the right side with the right hand, being able to shoot from the left side with the left hand is unexpected and usually succeeds. Fencing! People did not remember to guard themselves properly against me. Pool - people are used to setting up difficult right hand shots, but it was easy as pie for me. Racquet ball - That left handed spin and the ball generally goes to an awkward corner for right handers. Fencing. I'm actually perfectly competent with either hand at fencing, but I elected to do it left-handed because no-one else used a left-handed foil and whereas I was used to fencing right-handers, they weren't sure how to fence a leftie. Fencing. Most fencers are used to fencing other righties. field hockey, my reverse stick is incredible because my left arm is so much stronger. basketball, because I shoot with my left hand and it is hard for people to guard me. I actually use my right hand for throwing, punching etc - it's my stronger arm. I adapted to right handed. I am a fencer and as a child beat everyone solely because everything they have been taught is usually against a right-hander, whereas I have always fought against non-lefties. It was great for me, being a left hander in a fencing club is great as everyone wants to fight you and practice with you, as you are so rare, but so useful. I am not fond of sports. I am terrible at sports anyway. To say I switch "hit" would be a lie but I can switch miss. I bat and play golf right handed and was never forced to do either. It was just more natural. I could never hit a ball in rounders as I had to hold the bat in my right hand. I once made the whole class be late for dinner because the teacher wouldn't let us go until I had hit a ball. I did gymnastics for years and to this day I have trouble twisting in air. I do crown green bowling. It's so funny seeing the face your opponent pulls when you tell them you're left handed. It confuses them no end because they have to turn over onto the opposite bias and bowl completely wrongly to the jack, it's harsh but funny! I have had to adapt in every sport, that was necessary, to participate right handed. i love being left handed in rounders an cricket it gives an element of sup rise and helps our team when I hit it into the space!! I mostly play basket ball, strangely I'm better at dribbling with my right hand, surprising my opponents when I shoot or lay up with my left. I play a lot of soccer and most players are right-footed...so they expect you to use your right foot...so it surprises them and makes it harder for them to adapt. I play badminton and occasionally it can help being left-handed. My teacher commented that left-handed players he had seen were often better all-rounders and more confident on their back hand than a lot of right-handed players. Sometimes shots take right handed players by surprise. I can easily do a good forehand shot that goes to their less comfortable back hand. At rounders, the fielders don't always move round so I can hit it and get a rounder while they are hurrying to the other side of the field. i play lots of sports and my ability to use both hands is an advantage, one handed sports I play left handed and 2 handed sports right handed. When I play hockey I am strong on the reverse side. I also throw a ball with my right hand which makes things confusing, I will put my right arm forward with my right leg rather than opposites so it looks wrong and coaches take ages to work out why I do things the way I do. I play most sports right handed!! e.g. golf, basketball, softball, etc. I played first base in baseball, and my glove hand is always closer to the thrower than a righty's therefore I'd get the ball quicker and not have to turn my back on the base runner to catch. I also train in Karate, and fight right handed, so my power hand is always within 30 cm of my opponent, instead of the standard of 1m. I played little league baseball lefthanded. My dad gave me his glove. I really don't like any sports except track and field. I guess I choose sports and instruments that are not biased by handedness. I think in baseball it does. But I haven't played the game to know. I use to get walked a lot in little league, but then again I also got hit by the ball more than the right handers as well. I used to play softball at school. I think left handed people make better sport players because we can use other angles. I used to play volleyball, being lefthanded was a great advantage because I trained with right handed people and I could do things which no right handed could do. It gave our team something extra special. I used to switch batting hands halfway in rounders to confuse bowler. I'm ambidextrous at most sports....rubbish with either hand. I'm not good at sports no matter what you do. I'm pretty good at throwing with both hands. In basketball I was stronger left handed when other kids weren't. They didn't expect me to take off to the left b/c they did not. In fencing, the teacher said and I found it to be true that you have the advantage with the target area. in games like basket and netball I can use both hands and am used to playing against right handers - same with bat sports like rounders. In paintball, the Crayons pallet, is very easy for a lefty (i'm the only lefty) and it was and is easier for me to paintball and hide there because I always shoot left handed and it's easier, and also, any rightys who go there don't really have an easy time using it. in rounders and cricket as you can catch the fielders out. in rounders they are more observant and ready as people shout left hander about ten times first. however in sports such as badminton it can come to an advantage. In some sports it hardly if at all makes a difference, enough some speculate that it does. Volleyball- it's not as if it makes you a better player at all- righties can be just as good hitting 9's and such places where lefties "should" have the advantage. I personally hit on the left side, which is where righties should be better at, but for me that's where I excel. On a defensive perspective, a tricky left-handed hitter is equally hard to defend as a tricky right handed hitter, it just depends on the skill. Basketball- at and above the high-school level having a left-handed player can be an advantage, but it's so competitive that it may not make a whole lot of a difference it the long run. Baseball/softball- definitely as a lefty pitcher and/or batter. In tennis and badminton, people think you are going to serve the other way and are quite shocked. In tennis there is an advantage since most people are used to play against a right-handed player. In tennis, badminton etc I find I have an advantage because I am used to playing right-handed people but they are not used to playing a left-handed person. In wrestling could lift people better from with left which was unexpected. It would help in tennis if we played to a good enough level. It's not a really sport....but when we played speedball in school. (in class game) We would throw a soft (squishy) ball around and somebody would make the rules for each round. Such as....left hand throw only, or right hand throw only, or two hand throw, etc. For me, my throwing ability is almost the same in both hands. So I had an advantage. Maybe in some where coordination and dexterity is required in both hands. Most sports things, kicking, hitting, throwing, golf, I do right handed. My hand eye coordination is terrible and wasn't helped in sports such as tennis when playing against a RH player. However in rounders it was an advantage as the bowler and fielders had to adapt to me. My son is left-handed and he pitched in high school. Left-handed pitchers are always a big asset as most hitters are right-handed and cannot hit leftys as well! My volleyball coach always saw my left-handedness as an advantage because it often confused opponents. The ball would go to a different spot than they expected. I also was able to play a position that is easier for left-handers. Netball, Rounders, Football. People always expect the ball to go in the other direction. Pitching in softball and batting left throws of the right handers! Play all sports right handed and right footed. Played first base in baseball. Playing bat sports was good because if people don't notice, they don't move and it's easier to win. Rounders - bowling left-handed confuses the batter! Rounders - the bowler would aim to the right, and 2 non-bowls was a 1/2 rounder. rounders - win points when the bowler throws body balls, as they are aiming where the right hand should be. also, teams put the worst fielders on the left as no balls rarely go there, so when I hit the ball I dont get caught out ,and can therefore win rounders! also, football - can control the ball better with my left foot, which is most footballers worse side. rounders and cricket - throws the fielders off guard when there's a lefty in to bat! Rounders and similar batting sports. They have to notice quickly and change fielding positions. Rounders and tennis due to people hitting the ball to my backhand side in tennis, it has become a very strong shot. Rounders because Edward says he can hit the ball harder with his left arm than his right. Cricket because he says he's able to throw the ball further with his left arm. Rounders comes to mind, simply because people didn't expect me to hit the ball in the opposite direction to right handers, so were unprepared. ROunders especially, no one knows where the ball will go! Rounders they always panicked, which I never understood because I was rubbish and very rarely hit the ball! Rounders when batting - everyone was fielding on the other side to the direction I hit the ball!! rounders, nobody expects the ball to go to the right! rounders, nobody fields on the right hand side!!! Shooting at netball - opposition were confused. Rounders hit ball opposite way + therefore got farther. Soccer, because my right foot is a better kicker and I can trick the goalie then automatically switch to my left foot(which has more power). soccer, I was left front. most right handers don't expect you coming at them from their right. Soccer. I had a stronger left side than most others. Soft ball/Baseball, because everyone forgets to move to the other side of the field when a left-handed batter comes on. Softball, when batting, you are a couple steps closer to first base; it is easier to slap hit as well. Sometimes as the ball etc comes from a different area - also in games such as badminton and tennis I can use both hands so that saved a lot of running about. Sometimes it helps for tennis. I can get different spins. sort of, in lacrosse, being a goalie with the net on left side some times catch experienced player off-guard. Squash, cricket can play either hand with both. Switch hit in baseball and racquet ball. tennis - fooled the opposition !! Tennis - people just aren't used to the opposite spin, but I am to theirs! Also, since I also use my right arm/hand a lot (eg. in cricket), I have quite a strong double backhand (although not always so accurate). Tennis and badminton - due to adapting I can now play just as well with either hand. Basketball - play from either side of court. Tennis and badminton. I can use either hand. Tennis and some positions in softball were always easier for me than they were for others. Tennis because your opponents are often used to playing against right-handed people. Tennis, since balls come at other angles, being harder for competitor to hit. tennis, squash and badminton. my opponents expect the ball to come from the opposite side, so I win a lot. also, in squash, I felt I had an advantage as my left-hand was away from the wall and it was easy to hit the ball. whereas if I was right handed it would have been more difficult. the female version of Irish hurling is Camogie. My mother used be a camogie player - and taught me all the tricks for playing in a match. like standing with the hurley on the right when waiting for the ball, so the person marking me would assume I was right handed, only for me to swing the hurley with my right and put my left on top. it was quicker, faster and I got many medals for winning matches! Very good on the left wing in hockey! Volleyball, Basketball, and Softball. Because of the number of right hand athletes opponents get used to seeing the right handers way of playing. When a left hander is playing the opponents don't know what to expect and you have the advantage of messing with them when they are confused. Was taught to throw right handed. Couldn't hit the broad side of a barn. I was asked at age 28 why I was shooting dart righty when I'm a lefty. Didn't know why. Started using my left hand, felt weird at first, but I can now hit a bullseye and then general direction I'm aiming at. when I played soccer. I was the only one on the team that was left-handed. more one on one time with the coach. I could play from both sides of the field because I had also learned to kick with my right foot. when I played softball batting was an advantage and also when playing soccer people always assume you shoot with your right but not me. when playing rounders I could play with both hands, which was sometimes useful to confuse competitors! With rounders people always forgot to field to the other side of the pitch when it was my turn to bat! Yes for I was a pitcher & not a bad one either. yes, baseball. The fielders would always change & strengthen areas/positions when I was up to bat.